Designer Giambattista Valli knows how to make a woman feel beautiful. After all, he’s the man behind some of the most gorgeous red carpet gowns we’ve ever seen! Remember Rihanna’s drop-dead-gorgeous gown at the Grammy’s? Need we say more? Now, the Italian designer has ventured into beauty with an exclusive collection of lipsticks for MAC Cosmetics. And if you ask us, they are just as lust-worthy as his fashion designs. The collection includes five stunning matte lipsticks and a Crystal Glaze Gloss with a beautiful multicolored pearl finish designed to amp up each of the vibrant matte formulas. We got some scoop on Valli’s design process and inspirations behind the collection. Click through the slideshow to get a closer look. How did you and M·A·C decide on collaborating? Why beauty now? "I started working with M·A·C almost 10 years ago and since the beginning they understood and supported my vision as a designer. To celebrate this long standing relationship we thought it would be great to create a collection that was one-of-a-kind, more of a collector’s edition! I’m known for my dresses and with this collection you can dress your lips in Giambattista Valli." Why did you choose to focus solely on lip products for the collection? Describe your involvement with the process. "Lipstick can revolutionize a woman’s look. A lipstick shade or texture can radically change the way you are feeling in the moment. Makeup not only completes a look, it often makes the look. I love the idea of dressing up your lips in couture colors. The matte, highly pigmented shades are very modern and contemporary for a daytime look and then you can add a touch of the lip glaze over the top for a more sophisticated evening look. For me, the process was very similar to creating my clothing collections. The color palette for this collection is the DNA of GBV – reds, pinks, corals. Each color represents pieces of fabric from my dresses and each is inspired by florals and the beauty of a woman. When you are creating a collection, either clothing or makeup, you start with an inspiration, an idea. From there you use that inspiration to start designing the product. Then we play with the products and test them out. We see what works and what doesn’t work. It’s truly a collaborative effort." How did looks from past collections inspire each lipstick and lipgloss? "Each of the lipstick colors were inspired by the colors of dresses from my past collections. The colors come from pieces of fabric from each dress." Which shade is your favorite in the collection and why? "I can’t name just one! I love them all. There is a shade in the collection for every woman. I love the unexpected so I feel like every woman can wear any of the shades." If you could only describe this collection in one word, what would it be? How did the color matching packaging come about? "I see women carrying three or four lipsticks in their bag and they have to open each one to see the color and decide which one they want to wear. I love the practicality of matching the packaging to the color so a woman can easily just grab it out of her bag." How do you compare your creative process for fashion vs. beauty? "It is very similar. You start with your inspiration that then turns into the idea for the product, whether it is a dress or a lipstick. 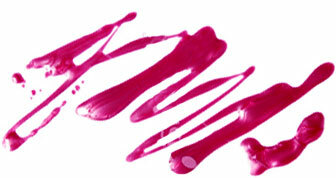 From there you think about the textures – types of fabric for a dress and types of finish for a lipstick. Once you have the products you test them out. You see what works and what doesn’t to then decide on the final product." What are the beauty rules you believe every woman should follow? "I believe every woman should be faithful to herself. I believe beauty is not a physical statement, it’s a mental position. I love confidence and a woman who isn’t afraid to leave her mark with a kiss!"